Puffed rice offers few calories and little fat per serving. The cereal is made from white rice, meaning that it is not a whole grain and contains very little fiber. Understanding the full nutritional profile of the cereal can help you determine how to make it part of your diet plan. One cup of puffed rice cereal provides 56 calories and just .1 g of fat. The calories mostly come from the 13 g of carbohydrates. The cereal has only .9 g of protein, making it an insignificant source. Puffed rice is enriched with extra vitamins and minerals. The refining process used to create the white rice cereal also removes many of the essential nutrients, so manufacturers add iron and B vitamins back into the product. 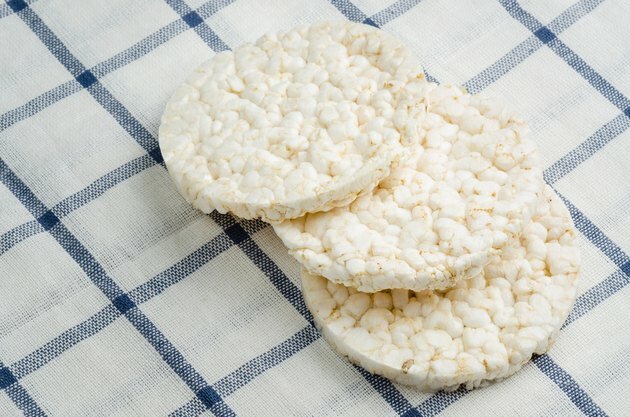 As a result, one cup of puffed rice provides 25 percent of the daily value for iron and niacin and 24 percent for thiamin, based on a 2,000-calorie diet. The cereal also provides 24 percent of the daily value for riboflavin and 10 percent for manganese. It is not a notable source of any other vitamins or minerals. You can use puffed rice to extend your serving sizes of more nutritious cereals. Many healthier cereals contain 150 to 200 calories per 1/2 to 1 cup serving. If you find these servings too small for your appetite, consider stretching them by adding 1 cup of puffed rice, which adds minimal calories, but may help you feel more satisfied. Eating puffed rice alone may leave you feeling hungry sooner because it contains no fiber or protein. The healthiest cereals provide at least 25 percent of most vitamins and minerals, notes Dr. William Sears. Healthy cereals should also provide a minimum of 3 g of protein per serving, feature whole grains as a first ingredient and contain about 5 g of fiber. Although puffed rice contains no added sugars, adding to its health value, it falls short in other nutrients. Consider shredded wheat, oatmeal or bran as healthier options. Can Rice Krispies Help You Lose Weight?